BrightSparks Scholarships and Higher Education Fair 2018 (BSP Fair 2018) pulled out all the stops with 50 scholarship providers and academic institutions assembling in one place, to offer students everything from undergraduate degrees at top local universities, to postgraduate master’s with overseas partners. 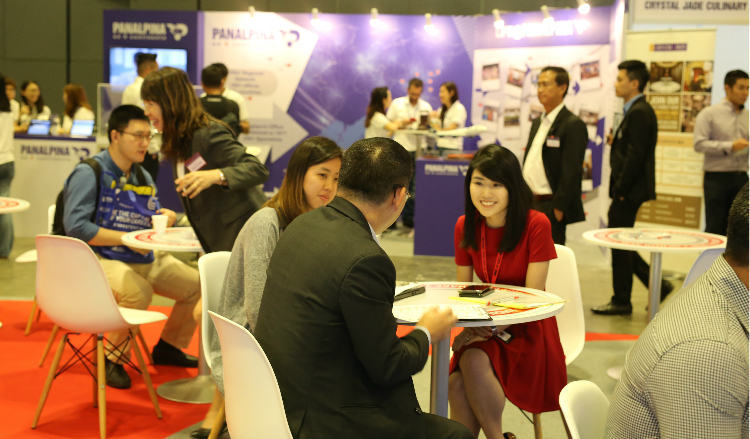 Over the last weekend of August at Suntec City Convention Centre Halls 401 and 402, the BSP Fair 2018 drew a crowd of around 500 who seized this opportunity to speak to top sponsorship organisations and colleges to gain useful insights into the scholarship, course, or institution of their choice. IDP Education, Smart Nation, and the Inland Revenue Authority of Singapore, who were the overseas education, platinum, and silver sponsors respectively, erected eye-catching booths donned with the latest programme booklets and information pamphlets, and even a robotic ‘staff member’ to ‘show and tell’ what the organisation is about. Besides one-on-one engagements with the management staff present, scholarship and higher education seekers could attend 12 complimentary seminars that were part of the fair. Speakers such as MOH Holdings, Changi Airport Group, Singapore Management University, and Singapore University of Social Sciences presented and answered inquiries on the possible ways the next generation can effect change in today’s climate and landscape, through scholarships and course curriculums that have been developed to enforce relevancy and practicality. Scholarship seekers whom JobsCentral interviewed echoed the benefits of such a rigour in the structures and programmes. Evelyn Foo, a 23-year-old bioengineering graduate from NTU, visited the fair to weigh the options she has for post-graduate studies. “I am open to any organisation and scholarship even if it is not directly related to my field of study. What is more important to me is the programmes are progressive and versatile,” she opined. “I am more inclined towards law and medicine, but honestly I do not have a chosen course yet, and that is why I came down here today to find out more information about the programmes. Also, I do not know much about scholarships and what they offer. As long as it is one that can align my talents with my interests, I believe it will be a good fit. I am keeping an open mind,” she chimed.